This car belonged to the owner when he was in high school in Cincinnati, Ohio. He is now a collector of some very valuable prewar and post WW2 cars, but never forgot this one and his many fun days in it. My son, and art collaborator, Tony is having a gallery exhibit of his abstract art in December and early January. Here is just one of the pieces. A proof sheet of the show is available upon request if you are interested. 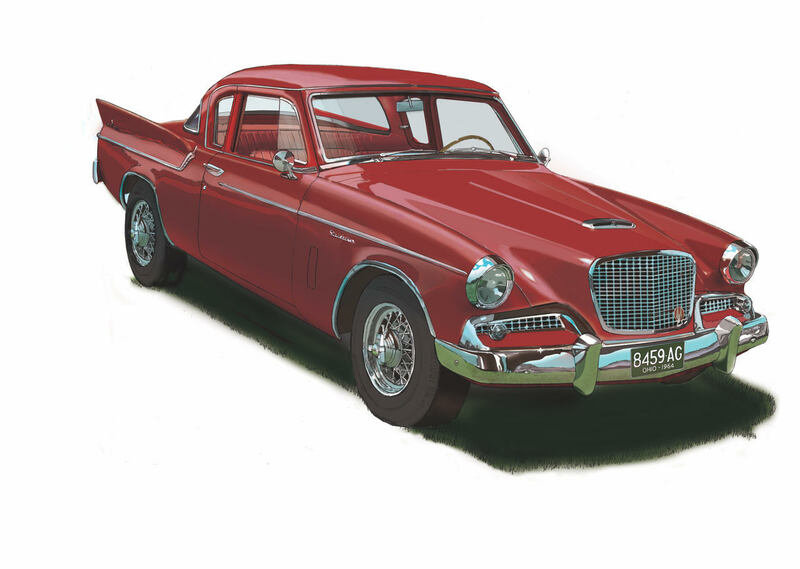 The illustration of the 1953 Cadlllac is taken from the 2018 Dayton Concours poster art. In the background to the left is Deed’s Barn where the “Garage Gang” met to work. 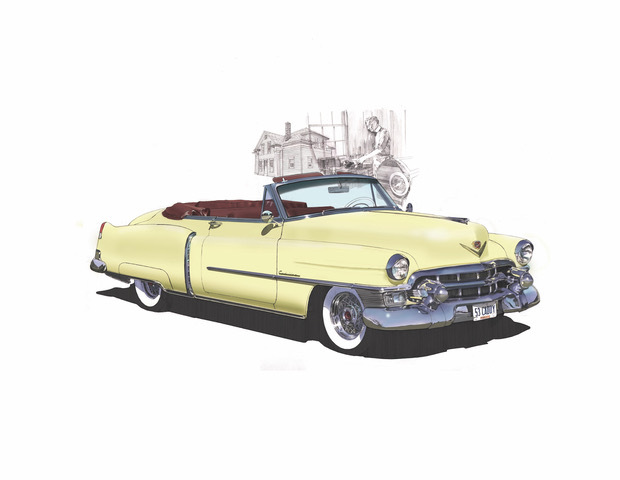 Among the inventions to come from the barn was the self-starter for the 1912 Cadillac invented by Charles F. Kettering, (also in the drawing), and the cash register. Of course the Wright Brothers were members of the “Gang” as well. The original art is 19 x 26 inches. 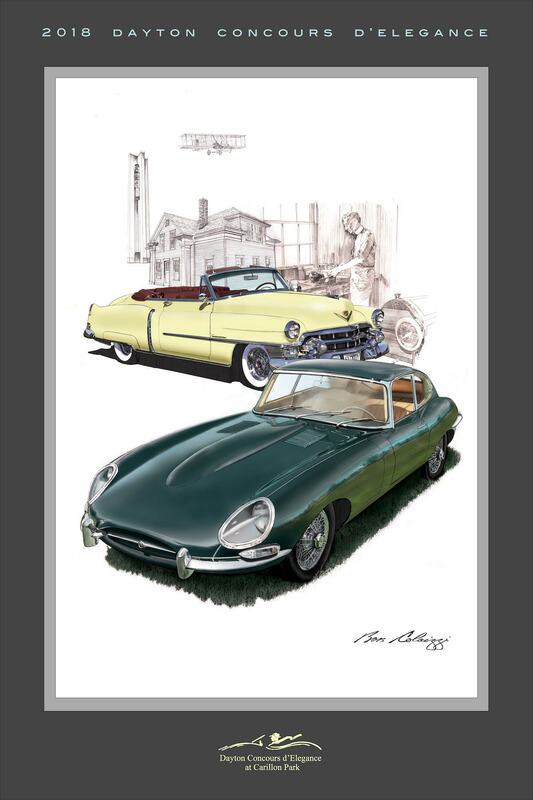 Individually signed Giclee prints are $175, 14 x 22 prints $125, 13 x 19 prints are $90. All plus shipping. 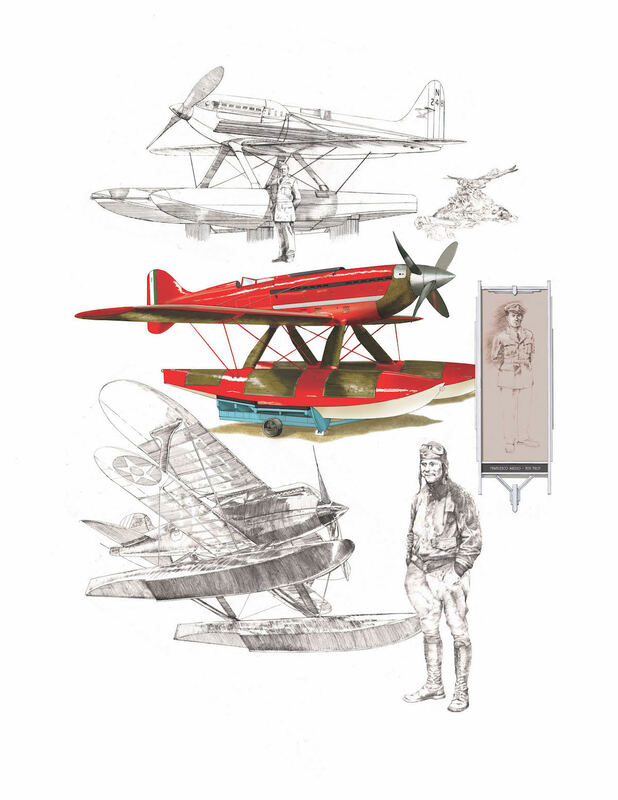 A collage of the three most significant Schneider Cup racing seaplanes of the 1920s. The Supermarine at top is the plane that retired the Cup in 1929 after the Italian Macchi would’t start. The Macchi was the fastest of all with a record 442 mph that stands today. Finally, Jimmy Doolittle, the only American who won the Cup in 1925 flying a Curtiss CS2-2. The top of the Schneider Cup is the drawing to the right of the Supermarine. Print #1 will be in The Champaign Aviation museum. Numbered, individually signed vertical prints 17×22 @ $150 plus shipping of $10. The piece came to be known as the “beer ad” as it developed around the illustrations of the two MGAs. It just happened the Zapata team mates all were drinking the same beer, Dos Equis. They were standing around the open hood of the number 107 car after the race. I first raced against these folks 33 years ago at Road Atlanta in my MGTD. Some great times and stories. These two cars belong a collector and vintage racer from Boston.The 1900 is due to launch on another international rally this year. 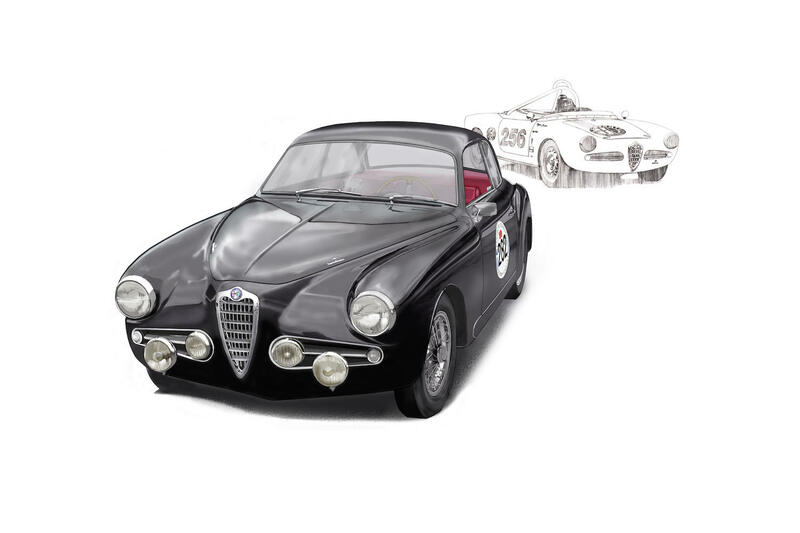 The Giulietta Spyder in the background is raced regularly in the East and came West to win its group at the 2017 Lake Erie Put-in-Bay race. 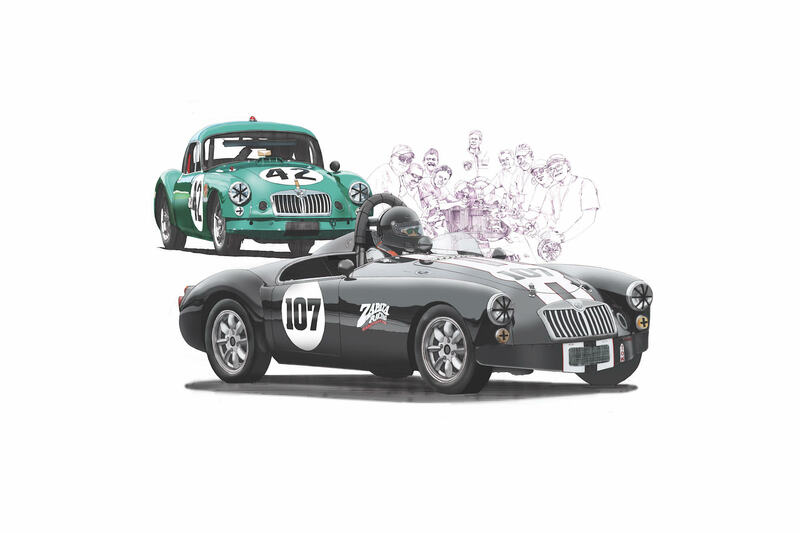 These three Allards are in the collection of a retired vintage racer. 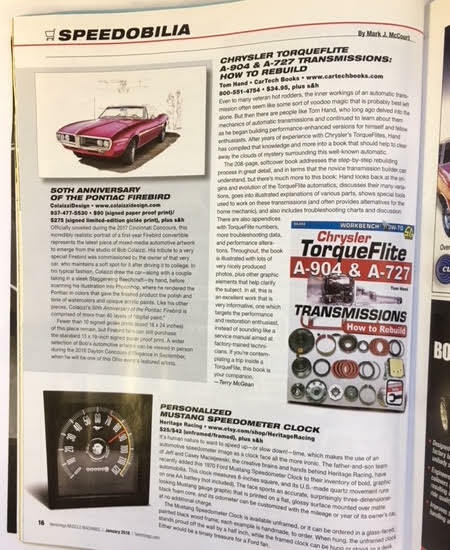 The piece features his J2X that won first place at the Keenland Concours this year. The top left drawing is his K2 formerly owned by General Lemay in the 50s. 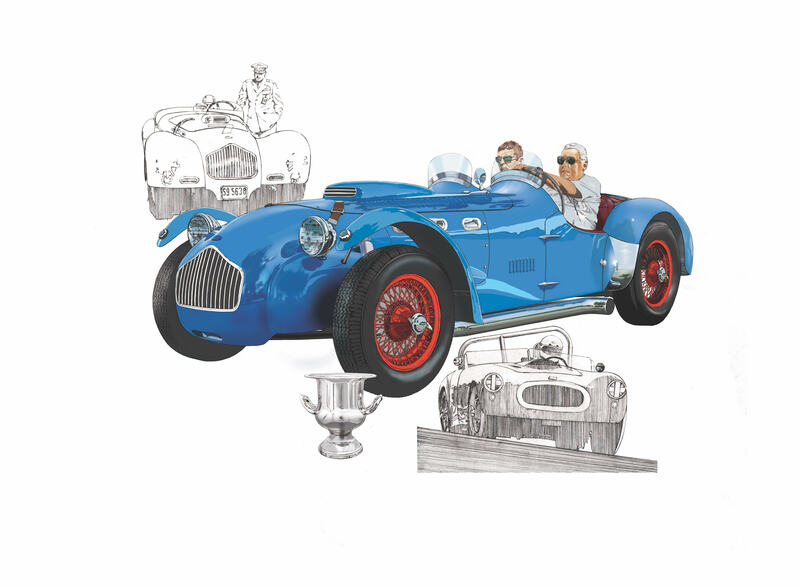 The last drawing, Bon doesn’t have any history on, but the owner also raced this car. The drawing is him at Mid Ohio. These were beasts with big American V8s in very stiff British chassis. They took a lot of arm strength and courage to handle.